This is a sensible and well informed article about wave of so called designer drugs. What they are referring to really is the stuff we are seeing since the new wave of drugs propagating through the internet since Mephedrone. New Black Market Designer Drugs: Why Now?. The damage caused by drugs, or the damage caused by drug policy? The Department of Criminology presents the third public lecture as part of the re-launched Scarman lecture series. The lecture will be held on Wednesday 13 June at 4:30pm at the Frank and Katherine May lecture theatre in the Henry Wellcome building. Please see the attached poster for more information regarding the lecture and the guest speaker. If you would like to attend please reply with your name and the name of anyone else that you would like to bring with you. Please feel free to forward this email to anyone that you think may be interested in attending. A drug derived from magic mushrooms could help people with depression by enabling them to relive positive and happy moments of their lives, according to scientists including the former government drug adviser, Professor David Nutt. Two studies, for which scientists struggled to find funding because of public suspicion and political sensitivity around psychedelic drugs, have shed light on how magic mushrooms affect the brain. Nutt, from Imperial College London, was sacked as a government drug adviser after claiming tobacco and alcohol were more dangerous than cannabis and psychedelic drugs such as ecstasy and LSD. He believes prejudice and fear have prevented important scientific work on psychedelic drugs. Research began in the 1950s and 60s but was stopped by the criminalisation of drugs and stringent regulations which made the work costly. “Everybody who has taken psychedelics makes the point that these can produce the most profound changes in the state of awareness and being that any of them have experienced,” said Nutt. Magic mushrooms may help with depression, say leading scientists | Society | The Guardian. If you are interested in these ideas then you might like to take a look at the work of the Multidisciplinary Association for Psychedelic Studies – http://maps.org/. Addiction Services in 2012 – where are we headed? The magazine ‘Addiction Today’ has produced a preview of the challenges faced by addiction services in 2012. The contributors come from a variety of different perspectives. Worth a read I think. Addiction Today: PREPARE FOR THE OPPORTUNITIES AND CHALLENGES OF 2012. I am the course tutor on the Foundation Degree. If you are working with substance users or would like to move into the field then the Foundation Degree might be the course for you. It is part time and designed to fit alongside work. It runs as a one evening a week class or as a Distance Learning Course, if you live further afield or need the flexible study option. Intake for 2012 will start in January. The Postgraduate Courses in Drug and Alcohol Treatment are specifically designed for people working with those who have drug or alcohol problems. The curriculum is based on the skills and knowledge required for effective treatment and course tutors are all practitioners from a variety of professions with many years experience. The course starts of with the Post Graduate Certificate and students can take this further to a Masters if they wish. Alternatively you can download the Information for Applicants and Application Form here. If you have read our blogs you will notice that we do a lot of work around substance misuse. This 1 day course is designed to look at the complex issues around what constitutes harm and patterns of alcohol misuse. We will also consider some practical strategies in terms of working with people who may or may not see their alcohol use as a problem. This is a useful introduction which then will provide an opportunity for further training in areas such as how Cognitive Behavioural Therapy and Motivational Interviewing may add to our work in substance misuse. To find out more about this course (and to book a place), click here. Alan Marlatt, who was a pioneer in addiction treatment died unexpectedly on the 14th of March. This link takes you to an interview with him. And this is a short article about his life and work. 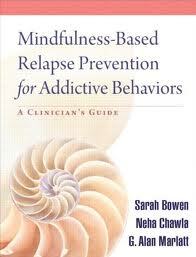 He is mostly known for his two key books on Relapse Prevention and Assessment he had a longstanding interest in Mindfulness applied to addiction work. His book ‘Mindfulness Based Relapse Prevention for Addictive Behaviours’ came out just recently and it looks like it will be an important stimulus for further work and research into this area.